Before you hit the islands... Eat! Bastion of curry, kopi and cake, Trang is one of Southern Thailand’s most pleasant provincial capitals. In addition to the fantastic food scene, natural attractions in the surrounding province provide something to do between sips of the local Robusta brew. Most come for the islands, but food and culture enthusiasts would be wise to hang around town. With around 60,000 residents and a trickle of travellers visiting in the dry from November to April, Trang is lively without being crowded; convenient without being touristy; intriguing but not at all contrived. A step removed from mass tourism, the city and a string of nearby islands welcome mostly Western families, couples and respectful backpackers, leaving the package tourists, sexpats and party animals to Phuket, Ko Phi Phi and Krabi. Like many Southern Thai cities, Trang was established on the back of the tin-mining trade that attracted thousands of Chinese migrants in the 18th and 19th centuries. The main industry switched to rubber when, in 1899, prominent governor Phraya Ratsadanupradit imported Thailand’s first rubber tree from Malaysia. It still stands in the nearby port town of Kantang, which also hosts a small museum and seafood restaurants set astride the Trang River. The area’s Chinese roots are evident in everything from the attractive Sino-European houses to the steamed buns and noodle soups often cooked in them. A streak of frangipani trees graces the main drag, where old-school cafes serve jasmine tea alongside the coffee (known here as kopi) grown in the Ban That and Khao Luang mountains that rise from the province’s eastern reaches. The area is also home to many Thai Muslims who add their roti, biryani rice and fiery curries to some great markets—do make Trang a priority if you love to explore via your taste buds. Some of the food has Malay roots, and the area is thought to have been part of the Kedah Tua kingdom many moons ago. The name Trang itself probably derives from the Malay word, terang, or "light”. Travellers hit Trang province mainly for its islands offering low-key alternatives to the big-name beach destinations. From Ko Muk’s “Emerald Cave” to Ko Kradan’s sublime sand and reefs, and even Ko Sukorn’s pastoral villages, the Trang islands are some of Thailand’s very best, in our opinion. All of them can be easily reached by minibus and boat transfer from Trang town, and hopping from one to the next is a breeze once you’re out there. Several islands can also be hit on day tours, though most foreign travellers spend at least a few nights in the islands. Dotted with karst cliffs, windswept beaches and mangrove forests, Trang’s slice of the Andaman Sea is also home to the endangered dugong, or “sea cow,” a close cousin of the manatee known for its peaceful disposition and jolly expression. Only a few hundred live in the wild here, mainly around Ko Libong, but you’ll see plenty in pictures and statuary throughout the province. While the city itself is short on attractions (beyond the food), day trip options include the caverns of Le Khao Kob Cave, a thrilling treetop walkway at the botanical garden, the angelic Ton Te Waterfall, and the empty mainland beaches of Hat Chao Mai National Park. You could also side track to Phattalung, another colourful town offering more of an offbeat experience just 60 kilometres east of Trang town. One final reason to stick around Trang town is its notably strong selection of guesthouses and hotels with comfy digs in the 300 to 800 baht range—good luck finding that in the islands. If you haven’t guessed it by now, we love Trang! Trang town, or Amphoe Mueang Trang, sits at the centre of the eponymous province in southwestern Thailand. The jungle-draped Ban That mountains form the province’s eastern border, with rubber, palm and rice cultivated over large swathes in between, and the Andaman Sea opening to the west. Phra Ram VI Road (also spelt Rama 6) is a main drag through town, beginning at the train station and running east past a clock tower at the busy intersection with south-to-north running Visetkul Road. Winding from west to east just north of Phra Ram VI, bustling Rachadamnern Road runs past the municipal market before turning into Phattalung Road on its way to the bus station, where it continues east as Phetkasem Road (Route 4). Kan Tang Road cuts from north to south through downtown towards the airport and, eventually, Kantang. Most travellers linger around the guesthouses, hotels, cafes and travel offices near the train station, but we suggest exploring deeper into downtown. A stroll around Phra Ram VI, Kan Tang and Rachadamnern will take you past dozens of picturesque rowhouses that are up to a century old. The main police station is located on the south side of Phattalung Road, a couple of kilometres northeast of the train station near the provincial hall. A nearby tourist police station is found on the same road, just west of Phattalung Soi 11. The public Trang Hospital (T: 075 212 241-3) is four kilometres northeast of the train station on Khuan Han Road. You’ll find several ATMs and banks just east of the train station—do stock up on cash if hitting the islands. WiFi is available at all guesthouses and most cafes. For maps and info on the area without pressure to buy something, the Tourism Authority of Thailand (TAT) has an office open from 08:30 to 16:30 north of downtown on Huai Yot Road, near Huai Yot Soi 11.  Please sign up as a Travelfish member to download the Trang guide PDF (7.3 MB, 36 pages). Membership costs just A$35 per year (less than A$1 per week) and gives you access to over 250 PDF guides. Use the above map to find specific destinations in and around Trang which are listed on Travelfish. Bed icons indicate a guesthouse, hostel or hotel, the knife and fork is an eatery or bar and the four-way circular thingy marks sights, attractions and other points of interest. Click on any icon for a short pop-up and a direct link to the page for that spot. If you are in the area, use the teardrop icon near the top left to show your position on the map (you'll need to allow position sharing for this last feature to work).